Cellmass 2.0 by BSN Review – Do you need it? It’s a popular misconception that you build muscle while working out. Although you feel your muscles a bit tighter and it has significantly increased in size due to pump, the real muscle-building process happens after you work out. This is the reason why you should consider taking post-workout supplements that help you boost your post-workout recovery. Post-workout recovery is an aspect of bodybuilding that is always overlooked. Many are focused on taking nootropics, thermogenics, and strength boosters to improve their workout performance, but only a small fraction of the bodybuilding community take post-workout supplements. BSN’s Cellmass 2.0 post-workout recovery powder aims to change that by combining strength and recovery ingredients to help users get the most out of their workouts. Post-workout supplements like Cellmass 2.0 are one of the safest supplements to take. Usually, these supplements are free from stimulants and nootropics, which are common in pre-workout supplements. Since it’s practically safe to take anytime, Cellmass 2.0 can be combined with your existing supplement regimen without a hitch. 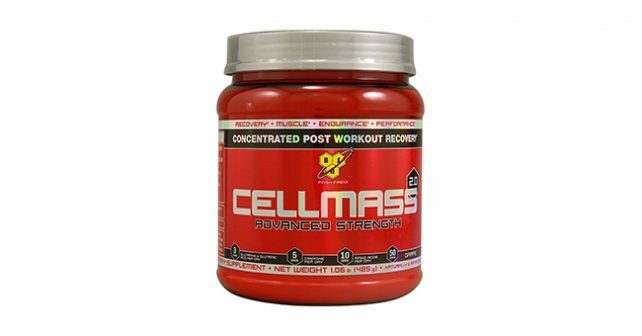 Post-workout recovery supplements like Cellmass 2.0 are typically used by bodybuilders who come to the gym often. Since recovery takes somewhere between 2-3 days, a typical bodybuilder can only hit the gym for a max of 4 times a week to give time for muscles to heal. Muscle recovery supplements shorten and optimize the recovery period to enable bodybuilders to hit the weight room more often. Cellmass 2.0’s primary ingredient is Creatine. Creatine is one of the most important supplements in bodybuilding since it boosts strength and endurance. Having creatine on your post-workout supplement absolutely makes sense since you can deplete most of your creatine stores in your muscles when you do intense training. The recommended creatine content is about 5 grams per day. Each serving of Cellmass 2.0 contains about 2.5 grams of creatine, which would be sufficient given that the recommended intake of Cellmass 2.0 is two servings per day. If anything, Cellmass 2.0 was recognized by Bodybuilding.com as the best creatine supplement for 2013. Another important ingredient of Cellmass 2.0 is glutamine. Your body naturally produces glutamine for a number of bodily functions including protein synthesis, growth hormone production, immune system booster, and recovery. Your body can lose as much as 50% of your glutamine stores, which makes you at risk for immune system breakdown and muscle catabolism. Glutamine has shown effectiveness but only if taken in appropriate doses. It would be quite difficult to gauge the effectiveness of Glutamine in Cellmass 2.0 since it doesn’t publish the exact dose of Glutamine per serving. Lastly, Cellmass 2.0 contains Whey Protein Hydrolysate, which plays an important role in protein synthesis. However, since the exact protein content in Cellmass 2.0 isn’t published in its supplement profile, it would be difficult to gauge if the protein content in Cellmass 2.0 is enough for your protein intake, or how much protein you would need to fill the deficit for your recommended daily protein intake. BSN is a known name in supplements, and despite earning awards as a creatine supplement, some users aren’t too happy with Cellmass 2.0. Actually it’s one of BSN’s lowest-rated products in a review aggregate website. When it comes to recovery and muscle mass development, nothing beats nitric oxide boosters. This formula would have been better if it included L-Arginine or Citrulline in the formula. Still, the creatine and glutamine content may give some bodybuilders exactly what they want with the replenishment of creatine and glutamine stores. Cellmass 2.0 isn’t a bad product at all, and you can stack it up with the best supplements for muscle growth like Deer Antler Maximum Strength. Deer Antler Velvet’s IGF-1 works best with the glutamine content of Cellmass 2.0, which also boosts growth hormones.